Get your Class of 2011 Shirts now!! 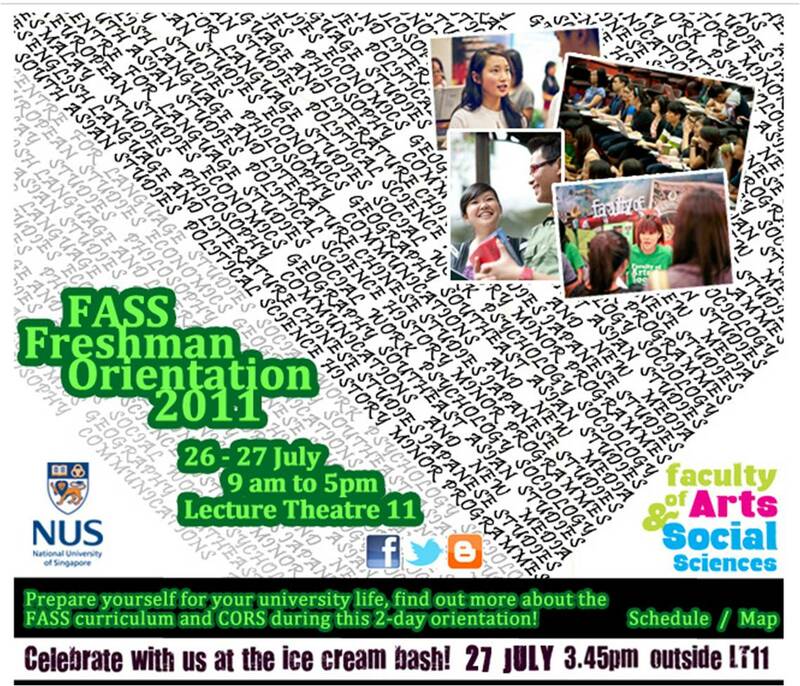 FASS will be holding Orientation Talks on 26 and 27 July 2011 at LT 11 and live webcast over at LT 12 & 13. By now if you are still having problems with the online registration, feel free to just come down even if you have not yet registered with us.We urge you to attend these talks as they will give you a better understanding of your degree requirements and of CORS bidding. Question and answer sessions will also be scheduled to clarify any doubts that you may have. See you guys there! It is really exciting to receive the World Future Foundation PhD Prize in Environmental and Sustainability Research for the AY2010/2011. I would like to thank the World Future Foundation for their generous support in the field of environmental studies. 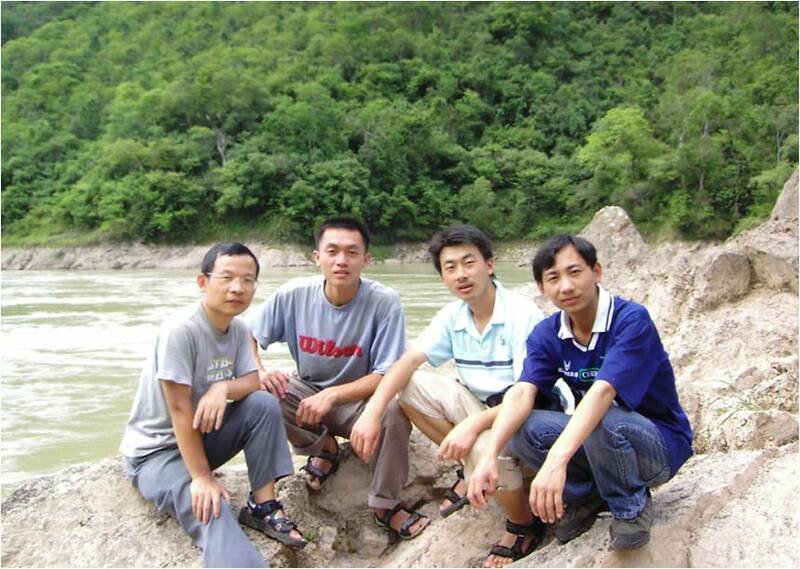 My PhD research concentrated on how to estimate suspended sediment concentration (SSC) of turbid rivers. SSC is a critical parameter in the study of rivers (e.g., water quality, nature hazards, bank erosion, river navigation, etc.). However, traditional measurements of sediment through in-situ sampling in rivers are expensive and time-consuming to perform. This is particularly true for the rivers flowing through a large mountainous region with tough transportation conditions. For example, during our arduous 45 days of field survey along the upper reaches of the Mekong River and the Red River in 2007, it was a big challenge even to find an access to the river from the road 30 meters away at some sites. Thus, these conventional methods cannot provide spatially and temporally continuous sediment records. Therefore, my PhD research focused on how to retrieve SSC of turbid rivers from satellite data with wide spatial coverage and high temporal repeatability. Although satellite remote sensing has been applied to estimate the SSC of sea waters as well as low turbid inland waters like lakes and short river reaches in previous studies, rivers, especially highly turbid large rivers, have largely been ignored. I investigated the relationship between spectral data and SSC through both field surveys and analysis of satellite spectra data. It was demonstrated that SSC could be estimated relatively accurately from spectral data in turbid river waters if appropriate SSC indicators were used, even when some crucial influencing factors were unknown. Furthermore, using the Yangtze River as a study river, I found that spatial distribution and temporal variations of SSC could be mapped out from satellite images directly. This helped improve the watershed management such as monitoring illegal sand dredging in river channels, and understand dynamic changes of SSC in a river system due to climate change and human activities. It is a great honour to win the prize. The prize will certainly hearten more students in Singaporean universities to work on environmental and sustainability research. Indeed, there exist numerous “hot” environmental problems in Asia. We, the NUS students, are able to make our contributions to sustainability efforts in Singapore and Asia. For instance, unresolved debates exist with respect to the possible impacts of the Chinese dams at the Upper Mekong River on the sediment downstream. Such debates may be attributed to the extreme lack of long-term and frequent sediment measurements in the Lower Mekong River. Based on the results of my PhD research, it is possible to estimate SSC of the Lower Mekong River waters from the satellite spectral data that are increasingly available. As a student of NUS, I am very happy that my PhD research is helpful. I expect more NUS students to choose environment and sustainability as their PhD topics. I believe that they will do better than me. 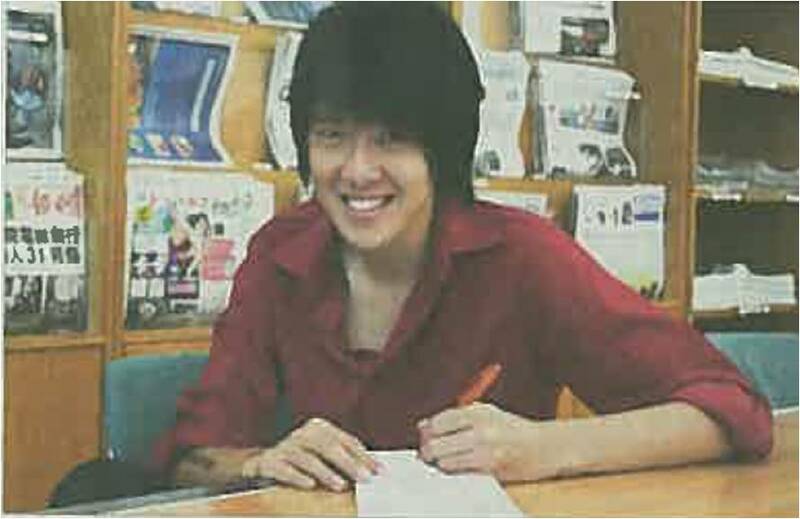 The Scholar’s Choice Preview special edition in Sunday Times featured two NUS FASS alumni. SPH scholar Eisen Teo who graduated in 2009 with first class honours loves everything about his job in journalism. NCSS scholar Muhammad Abu Sufian who graduated from NUS FASS Social Work Dept on the otherhand finds fulfilment in his vocation as a social worker. Click here to read more on Eisen Teo and here on Muhammad Abu Sufian. We would like to congratulate the following recipients for teaching undertaken in Semester I, 2010-2011.
for NEW FASS Research Students for Semester I, 2011-2012 only! The Division of Research and Graduate Studies invites you to a welcome tea with the Vice-Dean, Assistant Dean and other staff members. We are very excited to present to you our 1st “Meet the Editor” session. This will be the first in a series of sessions we hope to organise, which will provide you with rare opportunities to personally meet and chat with editors of prominent academic journals. Dr Hyung-Gu Lynn is the AECL/KEPCO Chair in Korean Research at the Institute of Asian Research, University of British Columbia (UBC) in Vancouver, Canada. He has been an Associate Editor of Pacific Affairs since 2002, and the Editor of the same journal since 2008. He regularly reviews for other journals in various disciplines, including those in geography, history, political science, cultural studies, media studies, and migration studies. Although he obtained his Ph.D. at Harvard University and MA and BA from UBC in the discipline of history, he has held past positions in an English Literature Department (in South Korea) and Institute of Economic Research (in Japan), and his research covers issues in contemporary and historical political economy, migration, international relations, media, popular culture, visual culture, and sports, mainly in Korea (both South and North) and Japan. *Please bring along your student card for verification. Doors will open at 2.45 pm. If you are interested, please register via this link by 1pm, Wednesday, 20 July 2011. Please note that entry to the talk is by registration only. Light refreshments will be served after the session. It was reported that Ms Faizah binte Zakaria received her Master of Arts (Southeast Asia Studies) degree recently at the NUS Commencement Ceremony. In addition, she was accorded the Benjamin Batson Gold Medal Award which is given to the most outstanding students in the course, at the ceremony. For her excellent results, she had been offered a five-year fellowship programme at one of the world’s leading universities, Yale University, Connecticut, United States next month. Ms Faizah took up her Bachelor of Science (Mathematics) study at NUS after being a teacher for five years, and subsequently pursued her Master’s degree. To read the article (in Malay), click here. Congratulations on your admission to the University and welcome to the Faculty of Arts and Social Sciences! You would, by this time, have read the section on the Faculty in the University Prospectus and noted the wide range of subjects available. There are a few events and dates that you should take note of in the days to come. 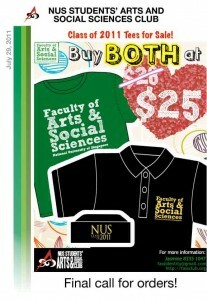 Matriculation Fair is the day where all freshmen would be affectionately welcomed into the NUS family. This event has traditionally been known as a give-away shopping fair and a milestone for many as the grandeur of it would make you proud to be part of the NUS Family. Freshmen will be introduced to the various aspects of your future university life and be well- equipped with information which are useful for your stay in FASS. Matriculation fair for NUS FASS undergraduates will be held on the 21st July 2011 at the Multi-Purpose Hall at the Sports & Recreational Centre. Those who have missed out on matriculating on the 21st can email the UG Registration at regbox25@nus.edu.sg for further queries. In order to further familiarise you with the curriculum, we will be holding Orientation Talks on 26 and 27 July 2011 at LT 11 and live webcast over at LT 12 & 13. We urge you to attend these talks as they will give you a better understanding of your degree requirements and of CORS bidding. Question and answer sessions will also be scheduled to clarify any doubts that you may have. 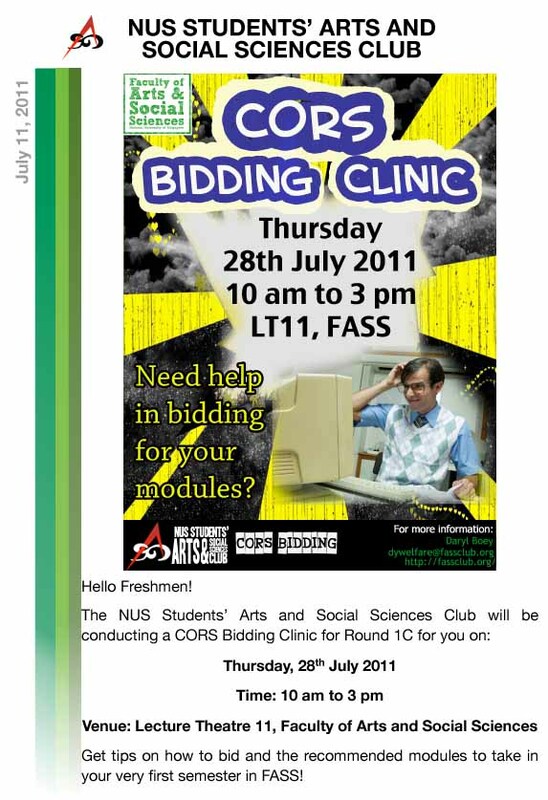 There will be a CORS Bidding Clinic organised by the Arts Club on 28th July 2011, which is also the start of CORS bidding for Freshmen. Instructions for the on-line registration of modules are also available here for your information and attention. If you want to find out more about CORS bidding, check out the CORS video. Click here to find your way to the Orientation Talks. We look forward to welcoming you to the Faculty! 10th July 2011 was indeed a special day for the graduating students of the Department of Chinese Studies. After the Commencement ceremony in the morning, many packed LT10 in the afternoon for a special celebration organised by the department. This is the second year that Chinese Studies is organising the event which seeks to further strengthen the relationship with our alumni, and more importantly, to provide a platform for them to express their gratitude to their loved ones, especially parents. The intimate and cozy atmosphere of our graduate, major, and double-major students and their guests created a familial closeness that was uniquely different from the carnival-like atmosphere of the commencement ceremony. The different feel and texture of the two events made graduation even more memorable to all. After a simple and touching speech by A/P Lee Cher Leng, every graduate received souvenirs and a special congratulatory letter from the department. Representatives from the undergraduate cohort, the graduating major students’ cohort and the Masters/PhD cohort shared their thoughts and appreciation with the guests. The highlight of the event was the PowerPoint presentation filled with words of gratitude and photographs of great sentimental value done by the graduates. As the slides ran through the pictures and appreciation messages, there was silence in the lecture theatre as the heartwarming love from the graduates reached the heart of their loved-ones. Some parents (and even grandparents) were quietly wiping their tears as they read the content. For some shy graduates who wished to show their appreciation in another way, they prepared hand-made cards and presented them to their teachers and loved-ones. Later, as the participants enjoyed the scrumptious buffet spread, they exchanged words of gratitude and took numerous photos before heading back home. It may have been just a two-hour event, but we believe that all members of the “Chinese Studies family”, including professors, alumni, and parents, will definitely remember the meaningful moments. We wish all graduating students all the best in their future endeavors!